Our favorite Spanish city also has the country’s largest cruise port, with a dock located at the end of the main tourist street, Las Ramblas. You walk off the ship, and you’re right there. Does cruising in Europe get any more convenient than this? Think of Barcelona as the gateway to all that Spain has to offer. Within a 15-minute walk, you’ll find gorgeous Gothic architecture, spectacular cathedrals, amazing tapas bars, fantastic chocolate and churros, one of the best markets in the city — replete with Iberico ham and Spanish olives — as well as creatively dressed buskers that are sure to impress with their commitment to the craft. Splurge: Hotel Omm – This decadent hotel has a Michelin-starred restaurant on the ground floor, a cozy living room-like lobby with a fireplace, a rooftop pool with killer views, and an unbeatable location in the tony Passeig de Gracia part of the L’Eixample neighborhood. Walk out the front door, and you’ll be surrounded by luxury boutiques (including Spanish ones, such as Camper and Lladró) and stunning art nouveau architecture, as well as several buildings designed by Gaudi himself. What more could you ask for? Steal: Hotel Market – Named for the nearby San Antonio Market on the edge of the El Raval neighborhood, this small 58-room hotel is just what your budget ordered: It has air conditioning (which is not a given in Spain), flat-screen TVs with cable (though many stations are in Spanish), free wireless Internet, spacious modern bathrooms, and even full-size blow-dryers. It also offers a three-nights-for-the-price-of-two deal and a package that includes breakfast, dinner, and cocktails in the lovely lobby restaurant. Breakfast: Churreria Granja Ruz – When we’re in Spain, we love to start the day with traditional churros and chocolate. It’s worth seeking out good ones, made to order — there’s nothing worse than cold fried dough, or hot chocolate that’s made from a powder. This small counter-only shop, on Carrer Princesa in the Bari Gotic, just down the street from the must-see Museu Picasso, does breakfast right, frying its churros in olive oil and serving thick, bitter teacups of chocolate. The only bad news: The shop closes when the crowd thins out at midday. Go early or risk being disappointed. Lunch: Café Viena – You can eat sandwiches made from Iberico ham just about everywhere in Barcelona, but the ones at this old-fashioned lunch counter are something special. Sidle up to the bar, hoist yourself onto a barstool, and order a sandwich and beer from the tap. Served on crispy baguette-style bread, the Iberico ham starts to melt a little from the heat, making it look glossy. Proof positive that this is something special: The New York Times named it the “best sandwich in the world” in 2006. Dinner: Tapas 24 – This decadent tapas place, the most casual of El Bulli alum Carles Abellan’s four Barcelona hot spots, serves unforgettably rich dishes from 9 am until midnight. Go in the morning for, say, eggs with chorizo or foie gras. Or, head there for lunch or dinner and feast on crispy croquettes, a foie gras “burger,” fried potatoes topped with foie gras, or a toasty ham and cheese sandwich. But it’s not just any ham and cheese: An ode to the regional fave, known as the “Bikini,” this crustless sandwich comes flecked with truffles. Nab a table outside if the weather is nice. Drinks: Casa Batlló – In the summertime, from late May through late October, the rooftop of this Antoni Gaudí-designed building on the Passeig de Gracia, is open every day starting at 8 pm. Sure, it’s pricy — you get two cocktails (included in the 39 euro entrance fee) and the chance to hear live music — but it’s also an unforgettable way to see an iconic architectural masterpiece, which is inspired by the Mediterranean Sea. 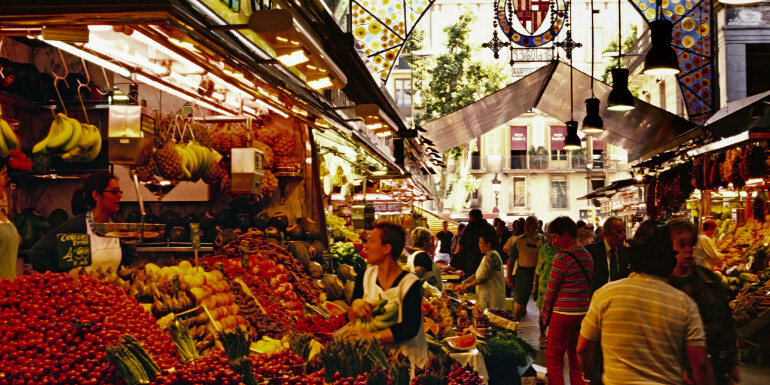 For Everyone: La Boqueria – Barcelona’s most famous market, originally built around 1200, is located right on Las Ramblas. It may be the best place in town to buy souvenirs. From Spanish olive oil and Manzanilla olives to Marcona almonds, honey-flavored nougat, and sherry vinegar, you can get just about any food that Spain is known for here — but resist the urge to buy Iberico ham to take home. It’s too sad to watch it taken away at customs. Instead, buy a paper cone of thinly sliced ham or hunks of Manchego cheese to munch on while you walk. For Couples: La Barceloneta – If what you really crave is a day on the sand, follow the locals to the city’s most beloved beach. Spend the day splashing in the surf and lying in the sun (you can rent an umbrella and lounge chairs for the afternoon). Then, change out of your swimsuit and get a late dinner of seafood-laden paella. (Hint: We hear great things about Suquet de L’Almirall.) A cab for the 20-minute ride from the port can be costly, so consider taking a bus instead. Just be prepared for the, um, more brazen way that Spaniards dress for the shore. 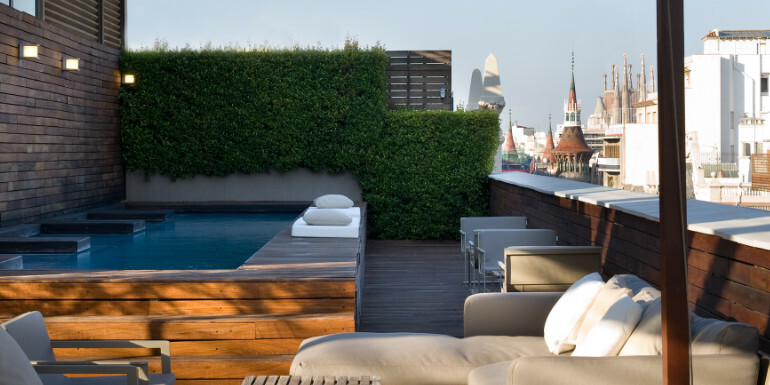 For Families: Pools – Unlike other metropolitan areas — including Paris and New York — many of Barcelona’s hotels have rooftop or terrace pools, including Hotel Omm (above), Hotel Arts, Hotel 1898, and the NH Calderon. Book a room at one of these properties, and the kids can play and splash and adults can admire the spectacular city skyline, including the cable car from Montjuïc and the spires of Gaudí’s Sagrada Familia. 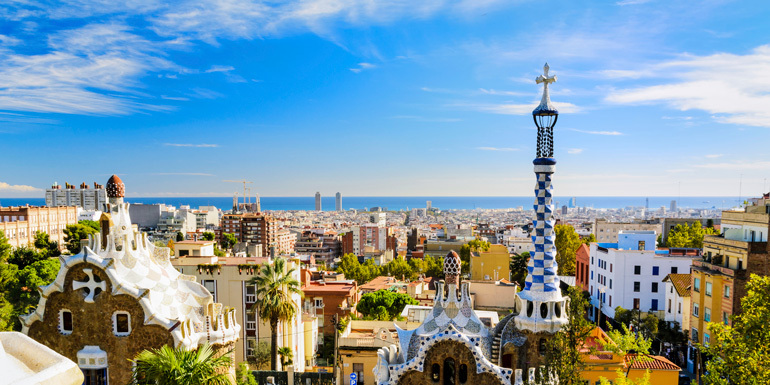 For the Adventurous: Park Güell – This amazing city park, built in 1900, was also the brainchild of Gaudí. While many visitors just stop at the gated entrance and admire tiled portrayals of salamanders and goblins, hikers will find this a worthwhile place to stretch their legs. Because the park itself is a whopping 40-plus acres, you’ll want to set aside half a day for a proper hike, especially considering the fact that the paths are built into a steep slope. While you’re in the park, look for native trees — including fig, olive, cypress, and almond — as well as parrots and the noticeably more rare eagles. In August, many of the city’s best restaurants close for vacation. If trying the cool modernist cuisine this town is known for is important to you, plan to sail here before or after the summer vacation period, and make your reservations at hot spots months in advance. What’s your favorite thing to do in Barcelona?